One of the crown jewels of the hobby last season has surfaced on eBay: the 2011 Bowman Chrome Prospects Bryce Harper Superfractor. The asking price: $24,999. The 1/1 insert is graded Gem Mint 9.5 by BGS. The seller is also accepting offers. Inserted in packs of 2011 Bowman Baseball, the card has BGS sub-grades of 9 for centering, 10 for edges, and 9.5 for both corners and edges. It will be interesting to see if the Bryce Harper Superfractor tops the more than $20,000 that the 2010 Bowman Stephen Strasburg Superfractor sold for. A 2010 Bowman Chrome USA Bryce Harper Superfractor eclipsed $12,000 when it originally sold nearly two years ago. 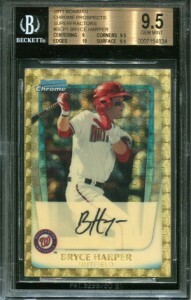 The 2011 Bowman Bryce Harper Superfractor isn't the only Superfractor of the top prospect that's currently listed online. A 2011 Bowman Platinum card featuring autographs of both Harper and James Taillon is being offered for $3,000. The seller is also accepting offers. Harper is expected to get called up by the Nationals before the end of the season.